Well it’s that time of year again. The time of year when tights replace waxing appointments, cosy knits cover up your skin for the frosty months ahead and when visits to the beach are accompanied by blankets and wooly shawls rather than towels and bikinis. And while wearing jewellery in the warmer months is super easy, wearing jewellery in cooler climes can be a little more difficult. Generally because your covered in those fabulously soft knits, great jackets and divine boots, not to mention the scarves, beanies and gloves. So any jewellery you may be wearing would be covered up and not on display for all the world to see. Personally, I tend to wear less jewellery in winter, but I do tend to rotate through more pieces as I take them on and off depending on which woolen item I am donning that day. 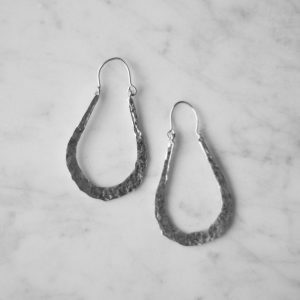 Earrings are great in all shapes and sizes for winter. They can add colour with semi precious stones and other interesting materials, such as silk, glass or ceramics, lifting your mood by injecting little rainbows of happiness into and otherwise, generally monochrome time of year. Alternatively, embrace those monochrome fashions and reflect the paired down mood of the season with minimalist styles in sterling silver, gold and oxidised silver. Using earrings as your main jewellery piece, either large or small styles, rather than bangles or rings is easier (when oversized coats and gloves are the days necessity) and can look great peeking under an oversized knitted beanie. When choosing necklaces to wear for the chilly months, layering is your friend. Rather than having that one piece sitting delicately on your décolletage, try wearing multiple necklaces in differing layers, which look great over clothes and the longer lengths are able to escape the cosy clutches of your scarf. 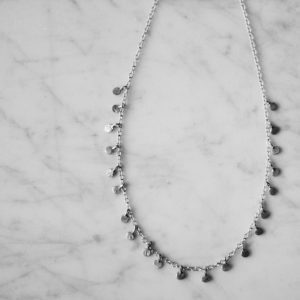 Make sure that the necklaces you choose are different lengths, and mix up the texture and thicknesses of your pieces. Or if layering isn’t your thing, try a chunky over sized piece peeking under your neck warmer. You can wear your smaller and shorter pieces around your neck under your scarf, which will make their appearance once you get into the warmth of indoors, and thus changing up the aesthetics of your necklace stack. The Sahara necklace from the basic elements collection offers a great length for adding to a necklace collaboration, and it’s mixed metal, being sterling silver and 22k gold plated discs. Alternatively you can loop this around your neck twice or even three times to create a layered necklace of a shorter length. (and as it has a clasp it can even be looped around your wrist to create a great bracelet). While I love a good ring stack any time of day or night, if your planning on wearing gloves, keep your rings and stacks to the smaller, more minimal styles in your collection. And if your sporting slim fit leather glove beauties, consider taking a little pouch with your finery in your bag to populate your fingers once indoors, toasty and gloveless (as I do). Or turn a ring with a small stone around, tucking the stone – such as with an engagement ring – into the palm side of your hand. Then when your gloves come off, your precious piece can be positioned into its more comfortable ‘look-at-me’ side. Rings with big stones are best avoided if your planning on wearing gloves unless you do the pouch-carrying trick as mentioned above. Or just put on so many rings that you create ring stack gloves! Even better! 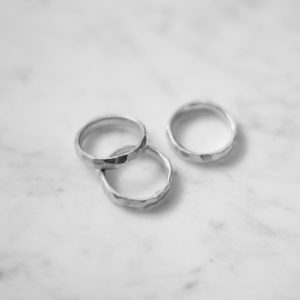 I wear a simple stack of 4-5 rings from the Basic elements collection, including the chunkier Orinoco ring stacked with the thinner Bay of islands, Cinque Terre, Copenhagen and Vienna rings. Plus a couple of simple stone rings from some of my fave jewellery designers, including French labels LeeLoo Bird and Monsieur Blonde and Aussie label Fairley. Depending on the size and chunkiness of your bracelets and bangles, these can generally just slip under or sit on top of those cosy knits and under that fabulous jacket. However if your planning on grabbing your go-to slim fitting leather jacket, I suggest keeping your bangles and cuffs to the smaller, close fitting side. 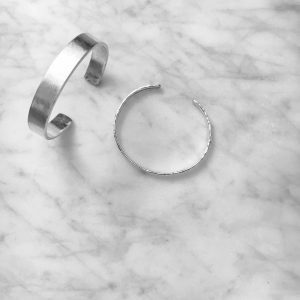 I wear 5 sterling silver bangles that fit quite close to my wrist and don’t get in the way at all, including the Zambezi and Orinoco cuffs and the Bay of Island bangle.